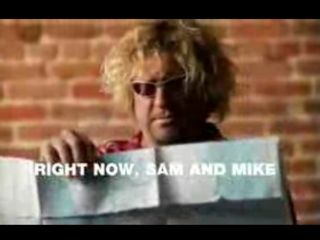 Right now, Sammy Hagar is in the studio recording with his supergroup Chickenfoot - or whatever they're going to be called. But also right now, Hagar has a solo album, Cosmic Universal Fashion, due for release on Roadrunner records in November. The record features a song called Loud, which features contributions from Hagar's current bandmate (and fellow ex-Van Halen member) Michael Anthony, Velvet Revolver drummer Matt Sorum and guitarist Billy Duffy from The Cult. The album's title track has already made it to YouTube, and it's something of a departure for the Cabo Wabo man. The video is an engaging and up-to-the-minute update of Van Halen's award-winning Right Now clip. The song, however, is something else altogether. The basic track was recorded by Iraqi musician Steven Lost, who sent it to manager Miles Copeland. Copeland then sent the cut to Hagar to see if he wanted to work on it. "Sammy became very excited by what he heard," says Hagar's manager, Carter (aka John Carter). "He wrote the words to it - it's almost a rap when you get right down to it - and then producer David Kahne came up with a bridge, did the drums and remixed it. It's unlike anything Sammy ever done, and he think it's one of his best works." The song is slated to hit radio in early October, and the album is due for release November 18. Sammy is planning to promote the album, but he's also got his hands full with the band formerly known as Chickenfoot. "The new band stuff is coming out amazing," says Carter. "When you hear it, you'll be completely blown away. Sammy, Satch, Chad Smith, Michael Anthony - they're all swinging for the fences. They've waited a long time to put a group together, and they're making the most of it." Still, there's the unresolved issue of a band moniker. "Think of something!" says Carter, laughing. "We've got a bunch of names floating around, but so far nothing has stuck. We should run a contest or something to pick the best name." Check out the video to Sammy Hagar's Cosmic Universal Fashion here. And be on the lookout in the next few weeks for an exclusive MusicRadar interview with Sammy Hagar.